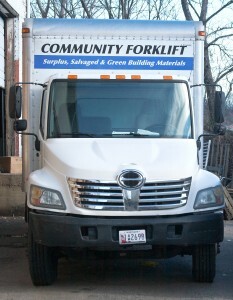 Donated building materials are the cornerstone of Community Forklift. We couldn’t exist without them. By donating, you can qualify for a tax deduction, reduce disposal costs, keep items out of the landfill, and support the community. 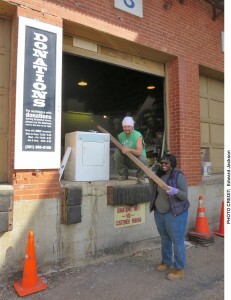 Community Forklift accepts donations of most new and salvaged building & landscaping materials, appliances, and tools, as well as antique and vintage housewares. We also accept furniture and commercial materials on a case-by-case basis. Please review our Donation Guidelines for more information. Planning a major tear-down or renovation? Consider Deconstruction! Click here to learn more. Dropping off your donation helps Community Forklift reduce its carbon footprint and use its limited resources most efficiently. Materials may be dropped off at our warehouse at Dock #3, which is in front of our building on Tanglewood Drive. Donations are accepted 7 days a week during regular warehouse hours, up until 30 minutes before closing. 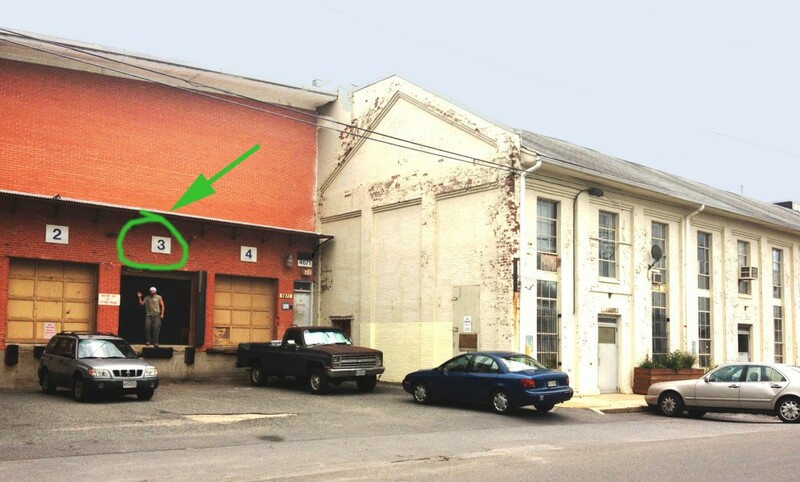 Please do not leave donations outside the building when Community Forklift is closed, thank you. Be sure to review our Donation Guidelines before loading up your car! You may also send pictures to Donations@CommunityForklift.org for review. Note that we are unable to provide a dumpster for rejected items, but you can check out our Reuse Resources page for a list of other donation and recycling options. For certain large donations, you can schedule a convenient and free pickup at your home, business, or work-site. Environmental stewardship is central to Community Forklift’s mission. Because our trucks are costly to operate and leave a large carbon footprint, we reserve them for large donations only. Pickups are generally scheduled two to three weeks from the time you contact the Donations Team, so please plan accordingly, especially if you are planning on a large-scale renovation or deconstruction project. If we get to your house or jobsite, and your donations do not conform to our Donations Guidelines, our drivers will be unable to pick up the materials. So please help us avoid the inconvenience, cost, and disappointment of a rejected pickup by reviewing our Donation Guidelines before scheduling a pickup. To schedule a pickup appointment or ask questions about a potential donation, click on the button below, fill out and submit the form, and our Donations Coordinator will get back to you within 3-5 business days. Please keep in mind that the review process for building materials and architectural salvage is complex and time intensive. Please help us expedite your request by including full details of your donation including quantities, sizes, brands, ages, etc. Photos of materials are also appreciated and will usually speed up our response time for your request. If you do not receive an email within 5 business days, please check your spam box, then email us at Donations@CommunityForklift.org to make sure we received your info. Items (and cash) donated to Community Forklift through its parent, Sustainable Community Initiatives, are tax deductible to the maximum extent allowed by the IRS. At the time you make a donation, Community Forklift will provide you with a donation letter itemizing the materials you donated. Unfortunately, the IRS prohibits Community Forklift from placing a value on your donated materials. If you plan to claim a donation value of more than $5,000, you must have the items appraised by a qualified appraiser prior to making the donation and you will need to submit an IRS form 8283 with your tax filing. Although we cannot recommend a specific appraiser, we can provide you with a list of appraisers working in the DC metro area. This information is provided for general purposes only. Please contact a tax professional before making a donation. If you need additional information, you can email the Donations Team at Donations@CommunityForklift.org or call us at (301) 985-5180. We are available Monday-Friday, 8am – 4pm.